“The Finnish bass-baritone Kim Borg was a well- regarded singer in opera and song from the mid-1950s to the mid-1970s, with a wide repertory but a natural preference for the music of Scandinavia and Russia. He was a specialist in the songs of his fellow Finns Sibelius and Kilpinen, many of which he recorded. He appeared in many opera roles internationally, his gifts as an actor much to the fore. Britain saw him on stage all too seldom. He appeared at Glyndebourne in 1956 as an imposing, if slightly too rough-hewn, Don Giovanni. In 1959 he returned to the festival as, more appropriately, Don Pizarro, in FIDELIO. At about this time, Sir John Barbirolli took a liking to Borg's voice, and afterwards frequently asked him to sing the roles of the Priest and the Angel of the Agony in THE DREAM OF GERONTIUS. When Barbirolli recorded the work in 1964, a version some consider the best of all, Borg was chosen for those bass-baritone roles. His self-evident sincerity of interpretation overcame the drawback of rather a thick accent. He appeared for the first time in recital in London in 1959, when his interpretations, and wholehearted powers of expression, were greatly admired. This was also the year of his debut as Count Almaviva (LE NOZZE DI FIGARO) at the Metropolitan Opera House where he appeared for the following three seasons. Borg's opera debut was in 1952 in Denmark as Colline in LA BOHÈME. This led to his breakthrough, when he was invited to take the short, but plum, bass role of Prince Gremin in YEVGENY ONEGIN at the Royal Opera, Copenhagen, where he was immediately engaged on a regular basis. It was at this point that Borg's international career took wing. He was engaged to sing the oily monk Rangoni to Christoff's Boris Godunov in Issay Dobrowen's ground-breaking recording of Mussorgsky's opera for EMI in 1952. Soon, Deutsche Grammophon was on his trail, and he made a number of recordings of opera, oratorio and song for the company during the following 10 years. Borg was much admired in Germany and, from 1965 to 1968, was a member of the Hamburg State Opera. But he was always welcome in his native Scandinavia, and from 1960 was a member of the Stockholm Opera, where his Scarpia was much praised in 1963. In 1971, he sang Fafner and Hagen in the company's performances of Wagner's RING. A year earlier, he sang Osmin at the Drottningholm festival, another histrionic triumph. He appeared in concerts at the Salzburg festival from 1956, singing Mozart, and in 1965-66 sang Pimen in Karajan's staging of BORIS GODUNOV. His Mussorgskian credentials were also confirmed by a fine recording of ‘Songs and Dances of Death’. “An elegant artist with a firm, though not particularly large bass baritone, Kim Borg was heard most effectively in recital. His Metropolitan Opera debut appearances as Count Almaviva did not show him to advantage, for the best part of his voice lay somewhat lower and, when pushed for volume, the instrument could take on a brittle quality. In the smaller houses of Europe and on the concert stage, however, he was a commanding presence. His singing of the song literature, including the songs of Sibelius, was authoritative and finely nuanced and the frequent inclusion of one of Sarastro's arias demonstrated his resonant lower register and unfailing legato. 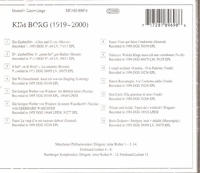 Borg was also a composer of some note, having written two symphonies, a contemporary setting of the STABAT MATER, some chamber music, and a number of songs. Borg's primary studies took place at Helsinki's Sibelius Academy, although he later undertook further training in Vienna, Rome, and even New York. After initially presenting himself as a concert singer, he entered the realm of opera in 1951 with a debut as Colline in Denmark. During that same period, he was engaged by Walter Legge for the role of Rangoni in a recording of BORIS GODUNOV to be made with Boris Christoff. The success of that recording afforded Borg international recognition. Subsequently, he was engaged by the Glyndebourne Festival where his Don Giovanni was received in 1956 as well-sung, but far too severe. Similar misjudgments about the suitability of roles thwarted what might have been a more fruitful Metropolitan career. Nonetheless, Borg made himself welcome in Stockholm, where he became a member of the Royal Opera in 1960. Another positive relationship was forged with Hamburg, where he appeared frequently.